Exchange Students who study in Gelsenkirchen or Recklinghausen normally live in one of our students`dormitories in Wodanstraße or Düppelstraße. Please apply with our accommodation form. If there are no rooms available we inform you in time. In this case we pass to you the contact dates of our students who spend a semester abroad to rent their dormitory or you look for a private room. The village is comprised of several houses each containing 2, 3 or 4-room apartments. It is situated in the part of town Gelsenkirchen-Erle in a very central position with local amenities only approx. 300m away. You will get the keys of your room from your tutor. There are also washing-machines and dryers within the student village. The rooms are furnished with bed, cupboard and desk. All rooms have Internet access. There are two double and five single rooms. There are several bath rooms and a big kitchen. 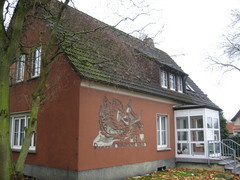 The residence is 10 minutes away from the Westfälische Hochschule Gelsenkirchen. The total rent per room is approx. 1.600 - 1.800 € per semester. You do not have to pay a deposit. You have to provide a down payment of 800 € for your reservation. The rest has to be paid by 1st Mai for the summer semester, by 1st November for the winter semester. The owner of the rooms is AKAFÖ. There is no university residence at our campus in Bocholt. Accomodation will be provided usually in private houses. The Departmental International Office at the Bocholt Campus will help with your accommodation. Students from countries within the European Union only need their EU health insurance card. If you come from a country outside the European Union, you need a travel insurance for the first 4 to 6 weeks of your travel to Germany. This travel insurance must have a cover amount of 30.000,00 €. After your arrival in Germany you have to take out a German student’s health insurance. The insurance fee is approx. 90,00 € per month. You will obtain addresses of health insurance companies upon your enrolment. Please don’t take out private health insurance in your home country for the whole period of your stay in Germany. This kind of insurance cannot be accepted and you would have to pay cash for medicine, medical treatment and a stay in hospital! Here you find more info about the health insurance system in Germany.